Does an organized space make you feel better? Reclaim space in your home — and in your mind — by adding smart storage and mastering a few key habits. A cluttered house can lead to a cluttered mind. Think about it: Every bit of clutter in your home is evidence of a delayed decision — “When can I tackle the mail?” “Where should the sports equipment go?” — that’s nagging you on some level every time you see it. The constant shuffling of material things is a drain on both your time and your mood, and, frankly, all that unnecessary stuff is just weighing you down. While a completely clutter-free home might be a pipe dream until your kids are out of college, there are a few simple things you can do to make your space more streamlined and reduce the time you spend picking up. Who knows what you’ll do with the extra time — maybe write the great American novel? It could happen. 1. Use unexpected storage. Whenever you’re making a furniture purchase, consider how it can help you clear clutter. Think about beds with storage underneath, outdoor benches that hide gardening supplies, side tables with deep drawers for reading material and remotes, and coffee tables or ottomans that open up to double as end-of-the-day dumping grounds. 2. Curtail junk mail. You can get those stacks of mail and catalogs to disappear! First, contact the mail preference service of the Direct Marketing Association to remove your address from direct-mailing lists. You can also call 1-888-5-OPTOUT (1-888-567-8688) to stop receiving credit card offers. Then, make it a habit to walk with your mail straight from the door to the recycle bin. Open it right there, dumping everything you don’t need. Put a plastic pocket or file nearby to toss the handful of items you want to save. 3. Wrangle kid stuff. 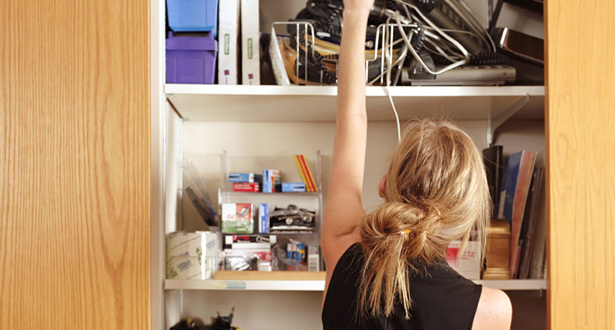 We all know that kids generate a lot of clutter — but do you have to look at it? Clear plastic over-the-door shoe caddies are a great addition to any kid’s room and can corral all those tiny toys, from figurines to cards to marbles. Zip-up pencil cases, tackle boxes or utensil organizers can neatly hide jewelry, beads, hair bands or art supplies. Set aside a toy box, bench or large bin into which the kids can sweep everything that’s lingering on their floor at bedtime. 4. One in, one out. If you’re serious about clutter, from here on out, whenever you buy, say, a new sweater, magazine, kitchen gadget or clothing item for the kids, an old one must be discarded, recycled or donated in order to make room. This keeps the level of stuff below the clutter point by limiting total numbers, and it can also save you money by forcing you to think hard about your purchases. This is a great rule to instill in your kids early on — especially when they’re clamoring for a new toy or game. 5. Bin there, done that. Invest in a few attractive, labeled bins for homework, art supplies, and sports or other extracurricular equipment, and teach every family member to use them. (After all, should you really have to drop what you’re doing to find your kids’ notebooks or pencils at any given moment?) Near the door, have a rack or basket for shoes, plus one for sunglasses, sun hats and sunscreen in summer, or for gloves and scarves in winter. You’ll not only get things off the floor, you’ll save time getting out the door. Win-win! How do you keep clutter at bay? Tell us your favorite ideas in the Comments below!